Bedtime Stories: Kittens! Kittens Everywhere! My kid may be pushing nine years old but that doesn’t stop him from getting any and all picture books related to kittens. Currently on high renewal rate are K is for Kitten and Kitten’s First Full Moon. Kitten’s First Full Moon is arguably the better of the two. It was written and illustrated by Kevin Henkes, a prolific author/illustrator many of whose books feature mice in teeny tiny outfits. 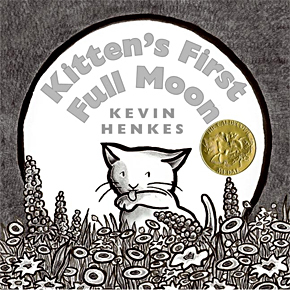 Henkes nabbed a Caldecott Medal for Kitten’s First Full Moon thanks to its simple but eye-catching images. The book follows around a tiny cute white kitty who is experiencing its first full moon and thinks the big white orb is a bowl of celestial milk. So kitty embarks on a quixotic mission to lap from the great white bowl of milk. But all kitty gets is a mouthful of bugs, or a tumble down the stairs, or a bunch of wet fur. Poor Kitty! it’s remarkable it took two people to create this book. The illustrations are done by Susan Jeffers, a prolific and talented illustrator and I think that’s what my son is drawn to. Admittedly, the kitty on the cover is pretty adorable. 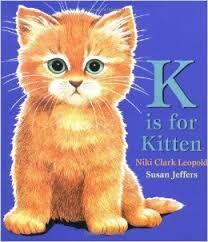 So if you know a child who like cute little kitties, both of these books are bound to satisfy their cuteness quota.